This week’s photo challenge (found here) required an unusual POV. Photography is, and never will be, my strong suit. Today however, appears to be quite the opposite. I promise this was nothing but an accident. A coworker needed to make a trip to Chase – a trip I make almost daily, as the gym I work out at is across the street. It was like any other trip I’ve made: running across the street trying not to get hit by buses or taxis. My mother would kill me if she knew how unsafe I was crossing roads. Apparently, I learned nothing as a child. I waited for her in the waiting area, looked out the window and…. LIGHT BULB… snapped this photo. I would really like to know what I looked like on the security camera: crouching down and awkwardly adjusting in my chair. I’m sure I made someone laugh. I’m a wee bit proud if it, I must say. Although, admittedly, black and white makes everything look better. But that’s just my opinion. 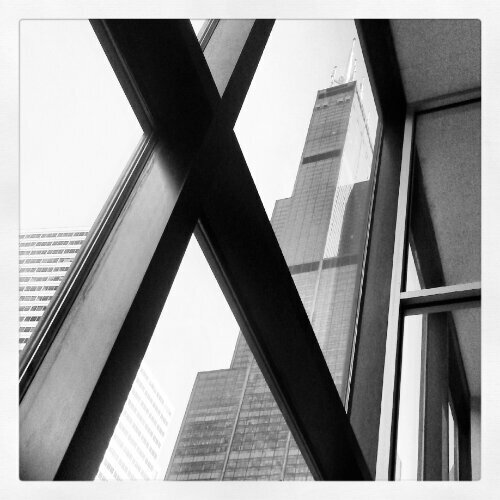 This entry was posted in Daily Post: Writing Prompts, Weekly Photo Challenge and tagged black and white, chase building, Chicago, it will always be the sears tower, photography, postaday, sears tower, unusual pov, weekly photo challenge, willis tower by Megan Elizabeth. Bookmark the permalink. Accidents happen to me too and they make for the best pictures. This one is fab! The B&W is perfect for this photo. Accidents happen all the time in photography and that’s great. You have to take advantage of them and you did. Thank u so much Janet! Pingback: From Different Angles | Not the Family Business! I really like your description of what others might have seen when looking at you taking the photo. Accident or luck, it’s an amazing photo. Very well executed, and B&W was as very good choice. And coming from someone who had a camera in the profile picture, I’m totally flattered!